Bonn, Germany -- This book is addressed to readers who wants to know how to turn their everyday life into a spiritual path. 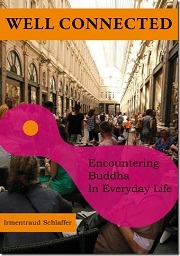 It introduces profound Buddhist ideas and principles through ordinary and mundane activities. In this approach to Buddhist practice the everyday world of other people, jobs, family and so on, is not an irritating distraction from the spiritual path, or something to avoid. Quite the reverse: the world and our fellow-beings are constantly reminding us of our connections to enlightenment. The only difficulty lies in seeing this. Rediscovering our natural connection to awakening is a joyful process. It happens in a playful way, with a light touch and a smile. We don’t have to make a great solemn effort to bring it about. Certain images or symbols from daily life may spontaneously touch or inspire us, allowing our natural awakened potential to gradually unfold. New possibilities arise, especially for parents with small children, people in demanding jobs and indeed for all of us with little time for formal meditation practice—opportunities to connect with the profundity of the Buddha’s teaching through the seemingly ordinary course of a day . Most of us long for greater meaning in our lives. Here that search for meaning is expressed in Buddhist terms, taking its main inspiration from a great Buddhist text, the Avatamsaka Sutra. However, the deepest significance of this search for truth passes beyond any specific religion. "Well Connected" is an extended translation of "Mit Buddha in Kontakt. Von der Kunst, sich mit der Erleuchtung zu vernetzen." published by Arbor Verlag. This English version is produced by Irmentraud Schlaffer and David Hutchens. Irmentraud Schlaffer, M.A. has been a practicing Buddhist for over 30 years and have a Master Degree in Tibetan and Indian Studies, as well as in History of Religion. In her Dharma activities, she aims to provide a way into Buddhist practice for Western people that is true to the tradition, but accessible at the same time. So the focus is applying Buddhist principles in modern daily life. Starting off with Vipassana courses, her Dharma path has led me to the Tibetan Buddhist tradition, mainly Kagyu and Nyingma. Since 1993 her main teacher has been the British Dzogchen master Rigdzin Shikpo (author of “Never Turn Away” and “Openness Clarity Sensitivity”), spiritual director of the Longchen Foundation (founded in 1976 by Chögyam Trungpa Rinpoche and Dilgo Khyentse Rinpoche).